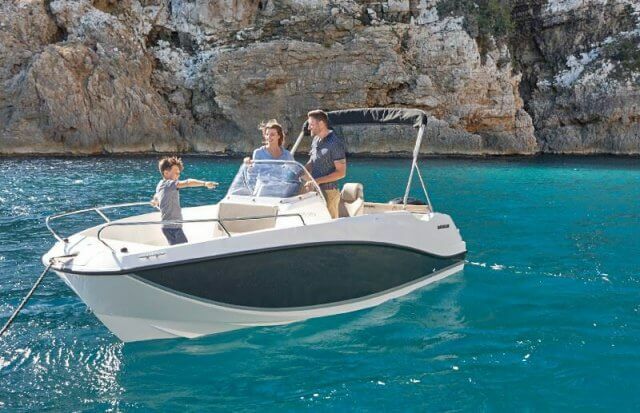 You’ll need a licence for any Spanish-flagged motor boat of more than 5 metres in length. 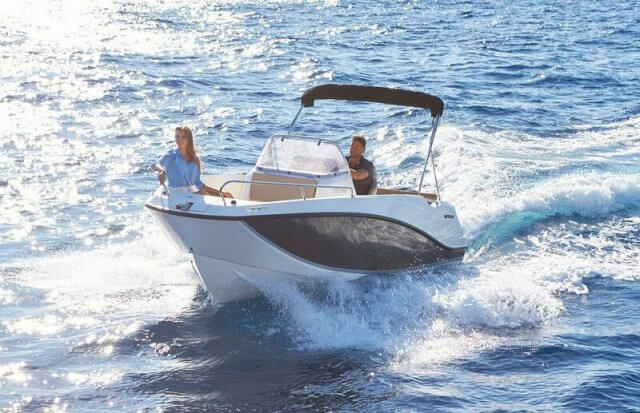 Without a licence, you can drive boats of less than 5 metres LOA (length overall) that have an engine with an output of no more than 11.26 kW (approximately 15 Hp). This exemption doesn’t apply to jet skis (Personal Water Craft or PWC). 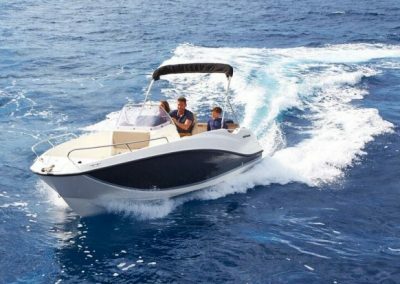 For a PWC, you’ll need the RYA PB2, a Boating Licence or a higher-level of certification. With the RYA Powerboat Level 2 certificate, you’ll be able to rent a powerboat up to 10 metres in length. There’s no restriction on the engine’s power output. 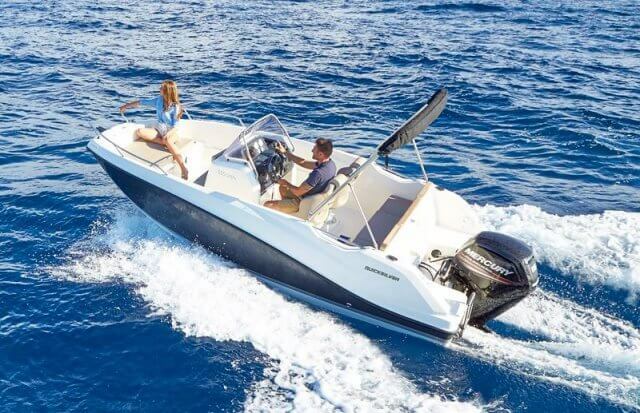 With the International Certificate for Operators of Pleasure Craft (ICC), you’ll be able to rent a powerboat or motor cruiser in accordance with the ICC endorsement. Depending on the course or exam you’ve taken to get the ICC, your certificate will be endorsed “Power up to 10m LOA” or “Power 10m LOA and over”. 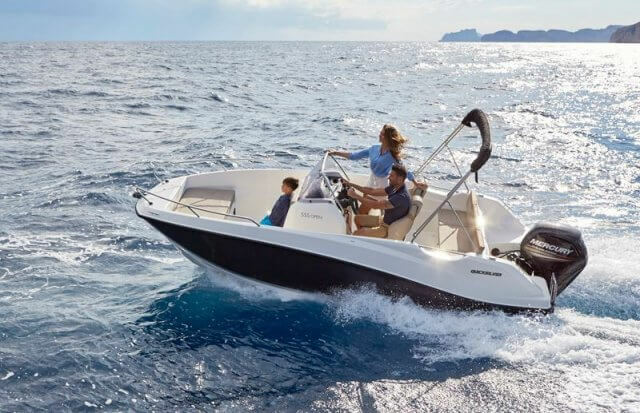 With the RYA Powerboat Level 2 certificate, you’ll be able to rent a powerboat up to 10 metres in length. There’s no restriction on the engine’s power output as long as the engine conforms to the manufacturer’s recommendations. How far can I sail? 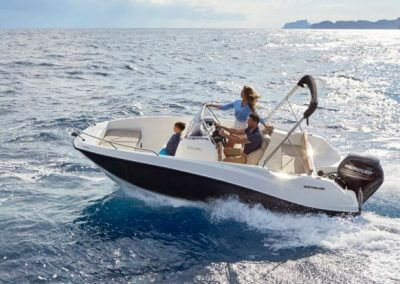 Most rental boats are coded to sail in either category 5 or category 6 waters (defined in terms of Spanish law). Category 5 means you can sail up to 5 nautical miles from a safe haven. 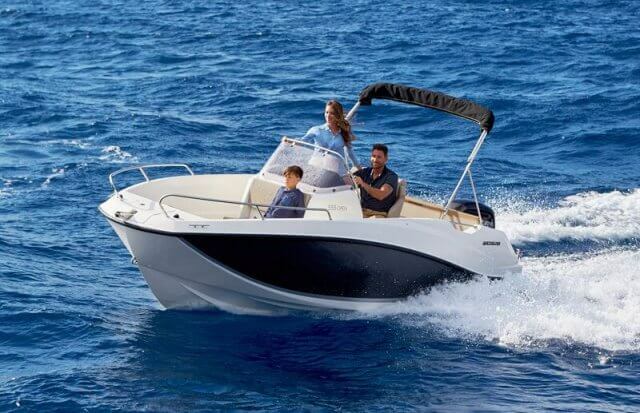 Category 6 means you can sail up to 2 miles from a safe haven. Most of our boats are also used as training boats and are coded to sail in category 4 waters (again, defined in terms of Spanish law). This means that you can sail up to 12 miles from a safe haven. The certificate doesn’t specify an actual distance from the coast. However, the RYA Powerboat level 2 syllabus talks about familiar waters during daylight hours; this is a good rule of thumb. 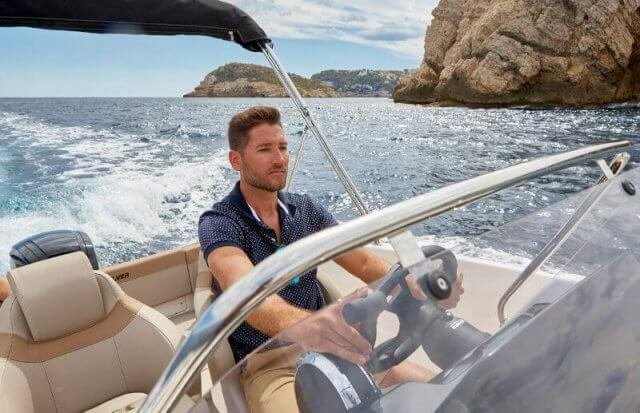 The Spanish Boat Licence specifically restricts sailing to a distance of 2 nautical miles from a port, marina or safe haven during daylight hours. Please contact us if you’s like to talk about your particular case. 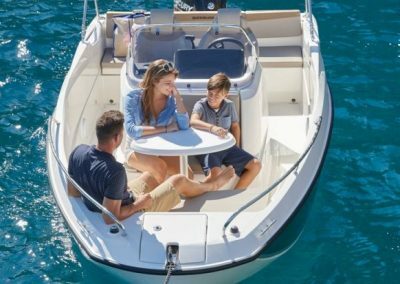 On the day of your charter, one of our professional skippers will talk you through the boat’s controls, mooring lines, safety equipment and extras. We’ll also explain how to get the boat safely in and out of its mooring and talk you through suggested routes (taking into account the weather), places to anchor and safe havens. The majority of our boats are coded for training and have a lot more safety equipment than most charter operators put on their boats. 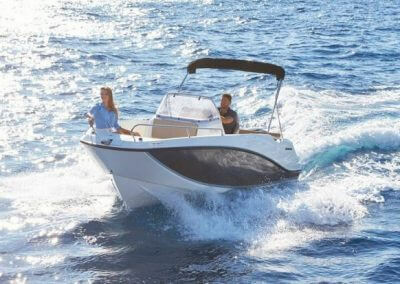 All our boats have bimini tops to shade you from the sun, CD player and VHF radio. The rental price includes full insurance in the unfortunate case of accidents. 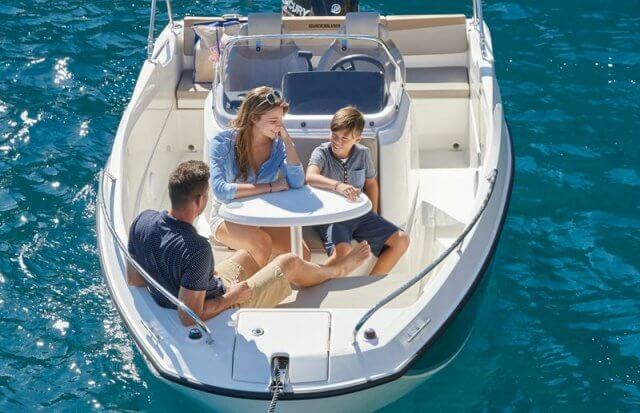 You will be liable for insurance deductibles and these vary according to the type of boat you rent. Your mooring in Marina de Denia is included in the price. Fuel isn’t included. We’ll hand you over the boat with a full tank and you’ll need to hand it in again with a full tank. We’re also more than happy to fill the tank up for you but we’ll need to charge you a small fee for this service. Aside from the vessel orientation at the start of your rental, your rental does not include training. Please contact us if you’d like to the whole boat for just you and your friends and you want tuition. Can I contract a skipper? 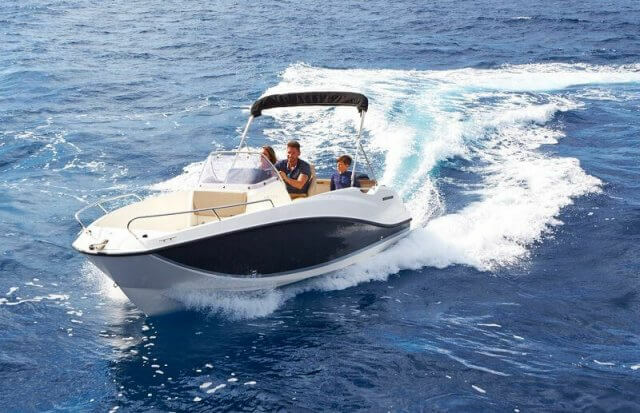 The Activ 555 Open is an ideal boat for a relaxing day out on the water for up to 6 people. 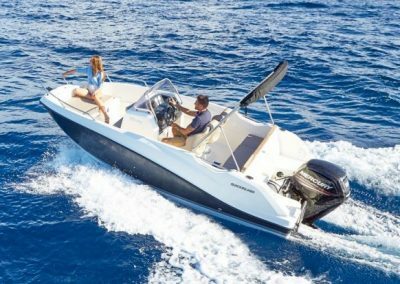 A single outboard Mercury engine (80 Hp) makes for agile navigation. You will need a license to rent this boat. 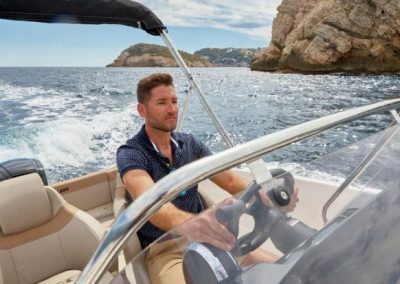 If you don’t yet have a license, you can either hire a professional skipper or rent the boat and do a course during the rental. Prices include VAT (IVA), insurance and safety equipment. If you don’t have a licence to drive this boat, you can contract a professional skipper or take a course before you rent. 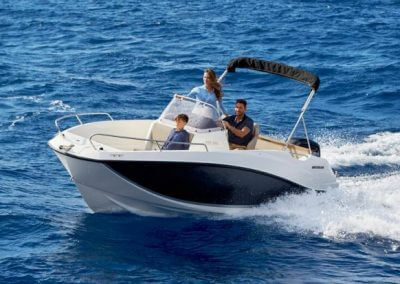 You can also choose to rent this boat and do an RYA Powerboat course or the Spanish boat licence. Note sure? Got any questions?